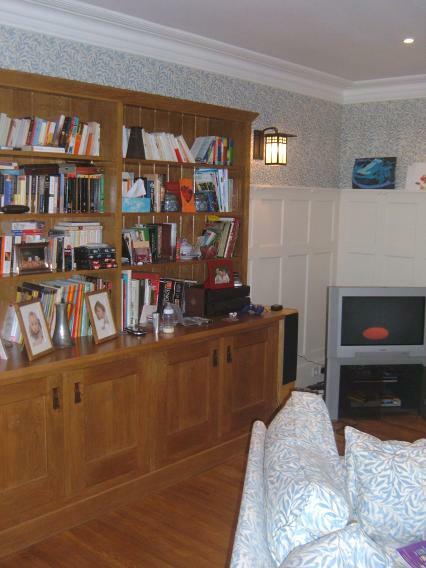 A stunning Arts & Crafts interior scheme, for a client in N. London. 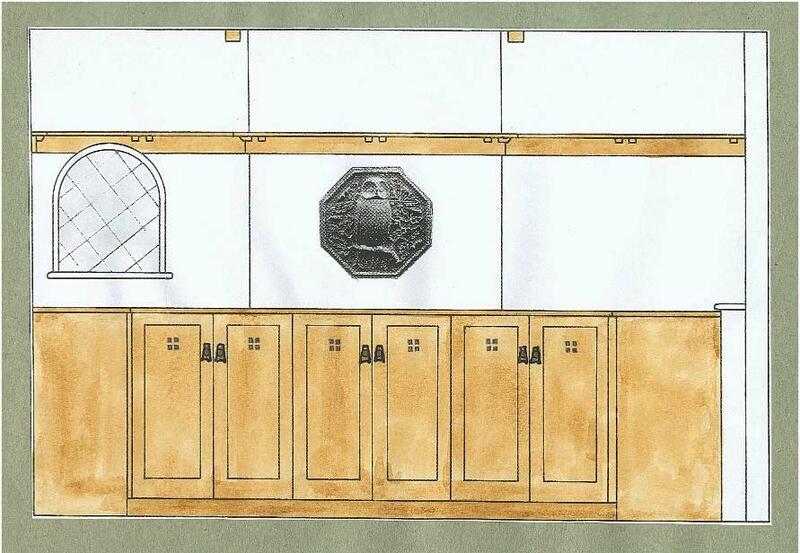 We re-designed the main rooms on the ground floor in the Arts & Crafts style. The kitchen was equally impressive, was equally impressive. 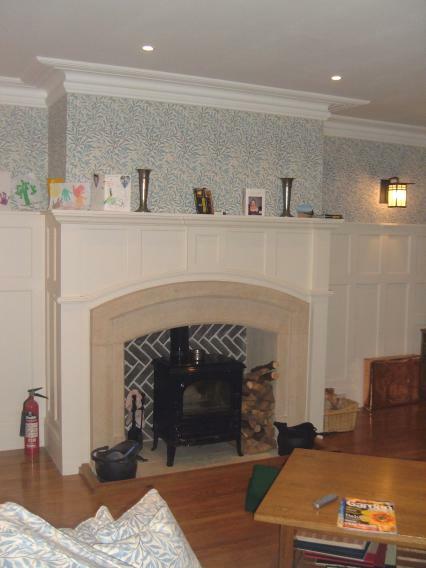 The client was a great fan of the Arts & Crafts style, and felt their newly extended house was the ideal opportunity to add the look they had long waited for. Initially we went over a lot of reference material with the clients, as the Arts & Crafts style encompasses a diverse range. We then produced a series of initial design ideas & reference photographs, fabric/wood/paint/plaster swatches, and narrowed the designs down further. 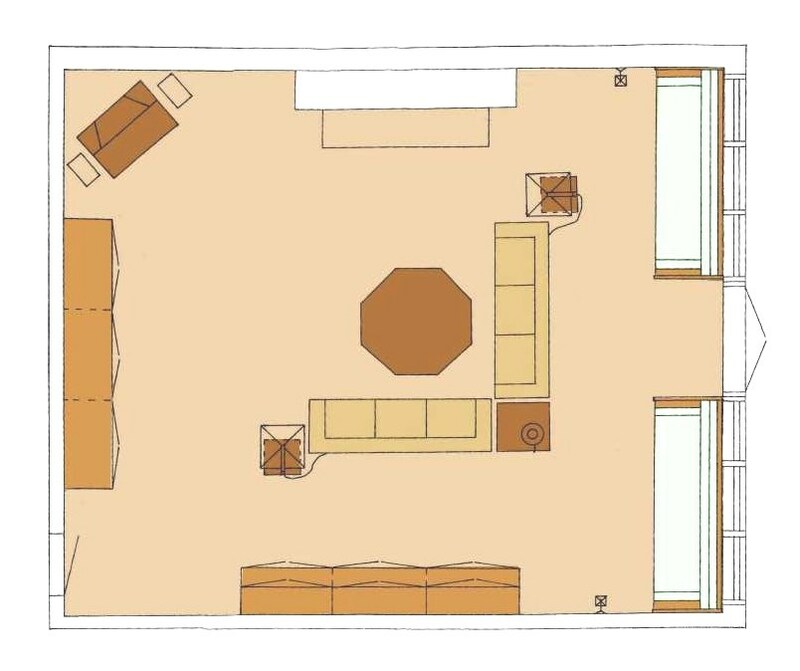 At this point we then produced the above designs for the living room, as well as designs for the entrance hall & kitchen. A few designs were amended in the course of the job. 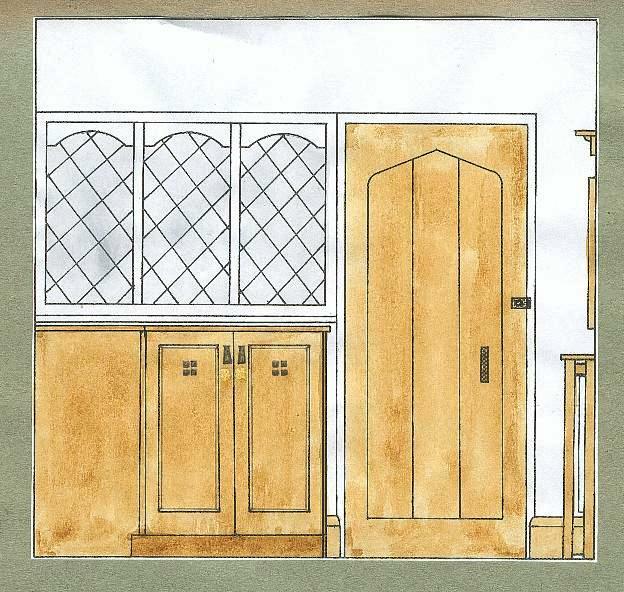 The clients wanted to achieve a look that was classic Arts & Crafts; a mix of Wm Morris / Philip Webb's house Standen, some CR Mackintosh & Mission style. They wanted the living room panelled & painted white as Standen. Standen was chosen as the model for the fireplace, with stone & herringbone brick back, surrounded by white painted wall panelling. 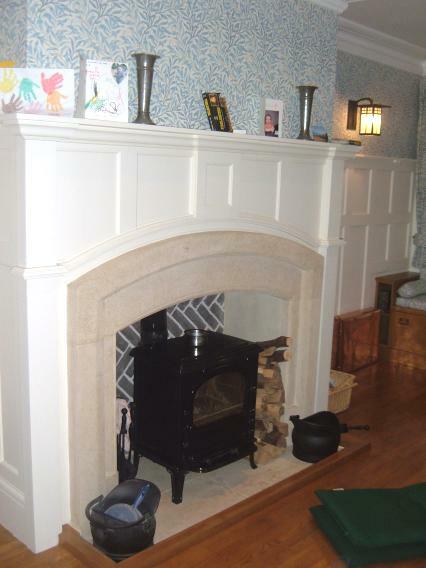 The large semi-circular top to the fireplace was left out in the end as the clients felt it might over power the room. The rest of the room was panelled upto 2/3 height; as it was being painted it was made from mdf to save cost (this was part of an expensive overall project). 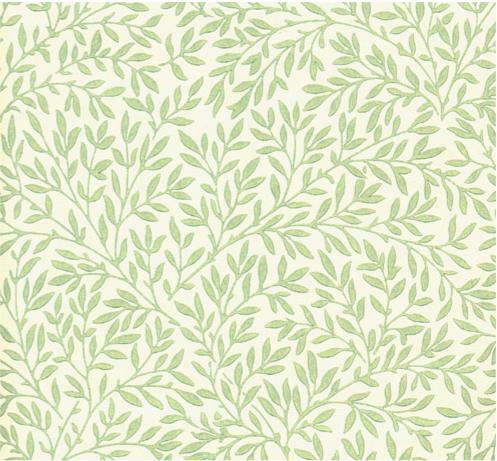 Morris & co. 'Standen' wall paper was used above the panelling. 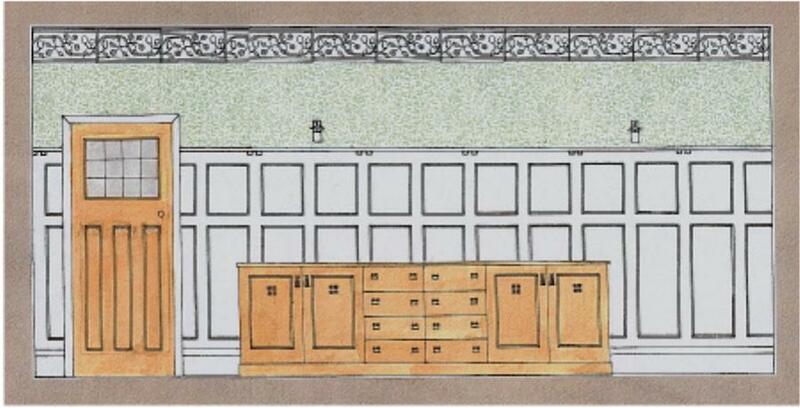 The intention had been to use a Gimson plaster frieze around the room (as per the designs above), which we have the exclusive use of, but the customer changed this during the course of the works. 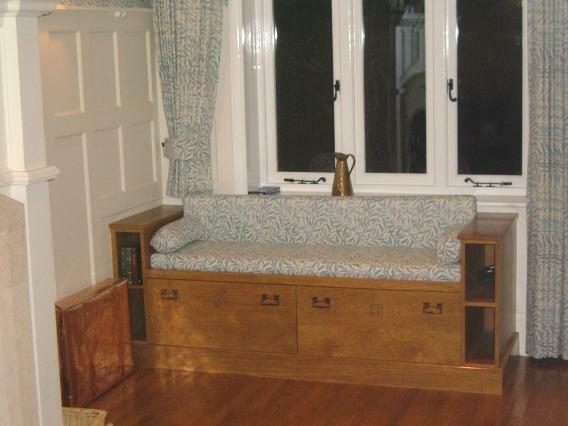 matching 'Standen' fabric was used to upholster the sofas, window seats & curtains. Mission style wall lights were added, which give a radiant look to the room in the evening. 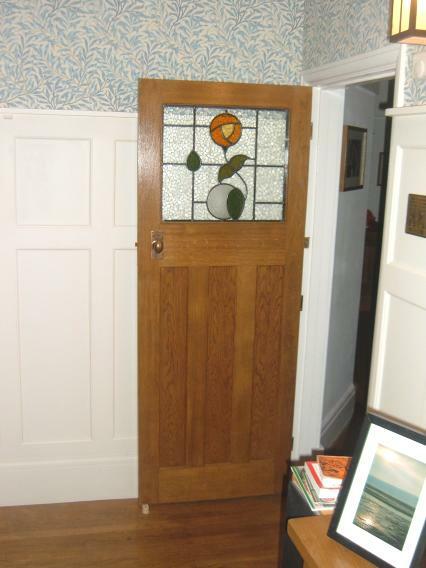 New matching room doors were produced for the ground floor rooms, with leaded & stained glass (the designs were similar to kitchen stained glass windows). 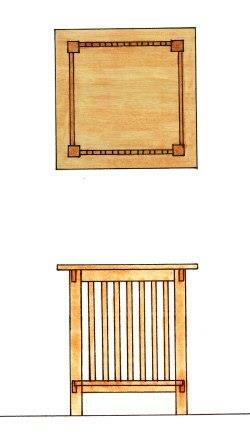 2 window seats & a large bookcase were also produced. They used matching details to the kitchen furniture, same square cut out designs, same handles, etc. 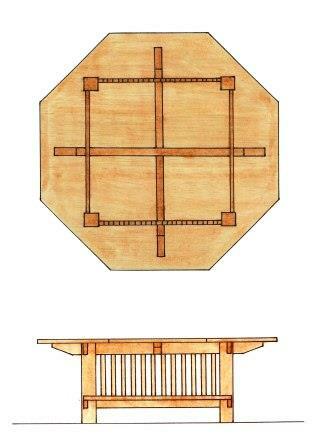 Shown above are the designs for the living room coffee table & 3 lamp tables, all in a Mission style. 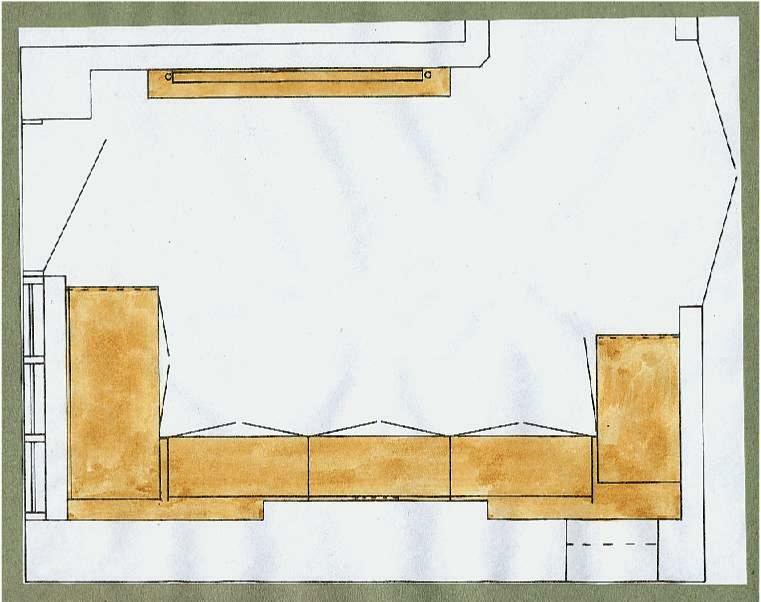 The coffee table top was octagonal because it allowed a large coffee table to serve both sofas, but still allow easy access around the sofas, as shown on the plan. The middle lamp table was made a bit bigger than the 2 end ones, as it has to work in the corner for 2 sofas. These were of a fairly standard Mission style. Left photo; the Morris & Co. 'Standen' wallpaper & fabric used for the project. Midddle photo; a 'Mission' Arts & Crafts handle used for the furniture. 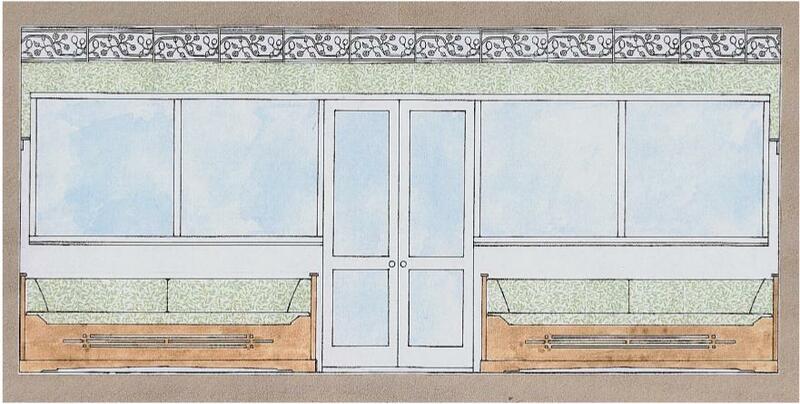 Right photo; the Gimson plaster cornice frieze originally planned. We also designed the entrance hall furniture, which matches the kitchen & living room furniture in terms of materials, finishes, handles, etc. 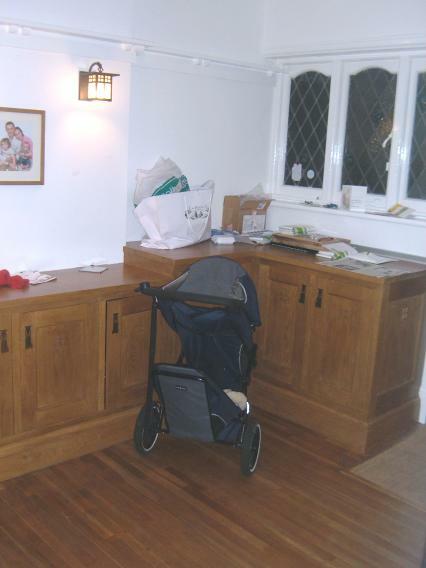 This included a large, split height sideboard running around 3 walls. This was for shoe & general storage. 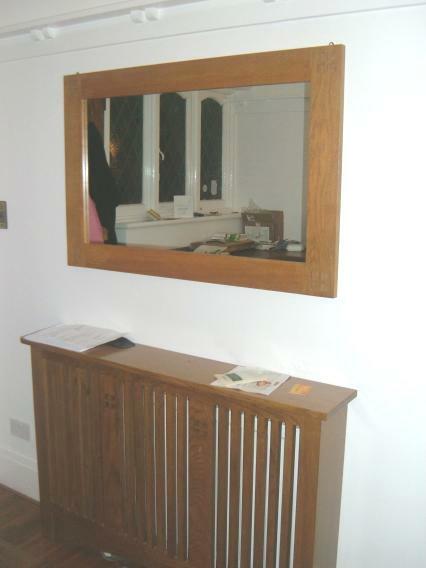 The new radiator cover case & wall mirror were particularly sucessful. Both are very Mission style Arts & Crafts. 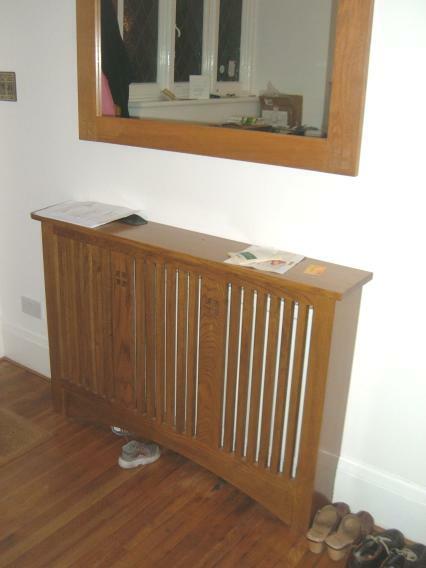 The radiator cover incs a couple of 4 square hole cut-out designs, a feature of all the furniture. The wall mirror had a 4 square matching inlaid design in each corner. Design shown below. Shown on the elevation is one of our exclusive reporductions of Norman Jewson 'Owl' plaster plaques he designed for Owlpen Manor. 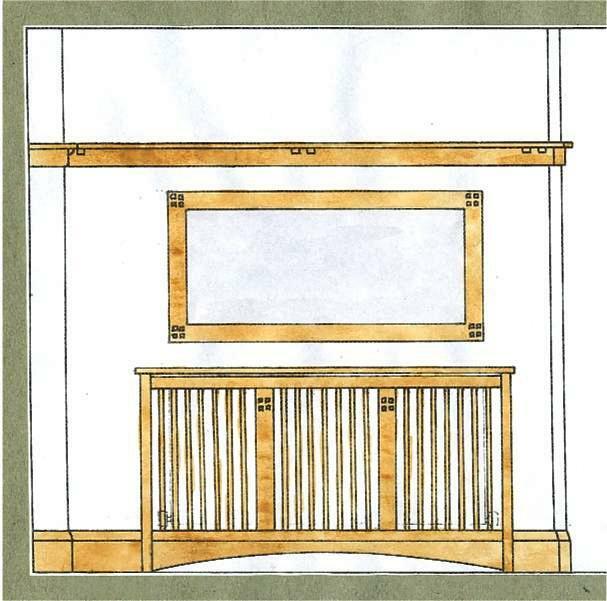 A plate rack was added around the room walls, which lined up with the top of the hall windows.